The Fisher Scientific 506G incubating oven is designed for everyday laboratory use. 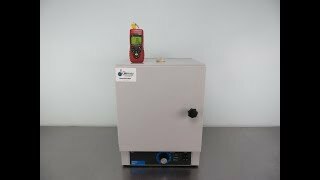 The temperature range on the general-purpose incubator is Ambient to 210°C ± 2.0° and has a capacity of 0.5 cubic feet. The Fisher Scientific 506G is constructed out of heavy gauge steel an Aluminum chamber. The door opens up to a 180° for easy unload and load of samples. The analog controls of the incubating oven are situated in the front allowing for easy access. The Fisher Scientific 506G maintains constant temperature uniformity and is a reliable incubator that fits neatly in any corner of your lab. 9 x 10 x 10"
19 x 14 x 14"
This Fisher Scientific 506G incubating oven has been tested and is peforming at factory specification. All of our lab equipment comes backed with our standard warranty. Should you have any questions, please don't hesitate to contact us.